^ a b c d e f Rudberg, Sten (1960). "Geology and Morphology". In Somme, Axel (ed.). Geography of Norden. pp. 27–40. ^ a b c d e f g Corner, Geoffrey (2004). "Scandes Mountains". In Seppälä, Matti (ed.). The Physical Geography of Fennoscandia. Oxford University Press. pp. 240–254. ISBN 978-0-19-924590-1. ^ Lidmar-Bergström, Karna. "Paleiska ytan". Nationalencyklopedin (in Swedish). Cydonia Development. Retrieved 22 June 2015. ^ a b Lidmar-Bergström, K.; Näslund, J.O. (2002). "Landforms and uplift in Scandinavia". In Doré, A.G.; Cartwright, J.A. ; Stoker, M.S. ; Turner, J.P.; White, N. (eds.). Exhumation of the North Atlantic Margin: Timing, Mechanisms and Implications for Petroleum Exploration. Geological Society, London, Special Publications. The Geological Society of London. pp. 103–116. ^ Klemsdal, Tormod (2005). "Strandflat". In Schwartz, Maurice L. (ed.). Encyclopedia of Coastal Science. Encyclopedia of Earth Sciences Series. pp. 914–915. ISBN 978-1-4020-3880-8. ^ Fredin, Ola; Viola, Guilio; Zwingmann, Horst; Sørlie, Ronald; Brönner, Marco; Lie, Jan-Erik; Margrethe Grandal, Else; Müller, Axel; Margeth, Annina; Vogt, Christoph; Knies, Jochen (2017). 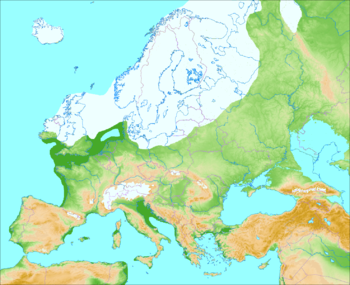 "The inheritance of a Mesozoic landscape in western Scandinavia". Nature. 8: 14879. Bibcode:2017NatCo...814879F. doi:10.1038/ncomms14879. PMC 5477494. PMID 28452366. Retrieved 22 February 2018. ^ Nielsen, S.B. ; Paulsen, G.E. ; Hansen, D.L. ; Gemmer, L.; Clausen, O.R. ; Jacobsen, B.H. ; Balling, N.; Huuse, M.; Gallagher, K. (2002). "Paleocene initiation of Cenozoic uplift in Norway". In Doré, A.G.; Cartwright, J.A. ; Stoker, M.S. ; Turner, J.P.; White, N. (eds.). Exhumation of the North Atlantic Margin: Timing, Mechanisms and Implications for Petroleum Exploration. Geological Society, London, Special Publications. The Geological Society of London. pp. 103–116.